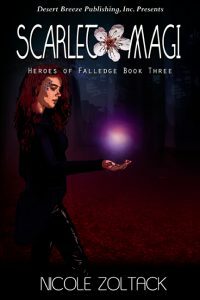 Nicholas Adams, the Black Hellebore, has lost his powers, and now, Falledge needs a new superhero – or superheroine – to save the day. Enter Justina Paige. Courtesy of Gavina the witch, Justina has a second chance at life. While Justina struggles to master her new magical abilities and tries to move on from Nicholas, she soon realizes that gruesome murders are the result of a twisted super villain, plus Gavina had an enemy who seeks her blood and is far stronger than Justina can hope to face and survive. With the help of a hot newspaper writer and a male witch who Justina, and Gavina before her, is attracted to, Justina does everything she can to try to save the day even as she grows closer to the two men. If she fails, her friends and loved ones may die. She might too. And then all of Falledge will be destroyed.